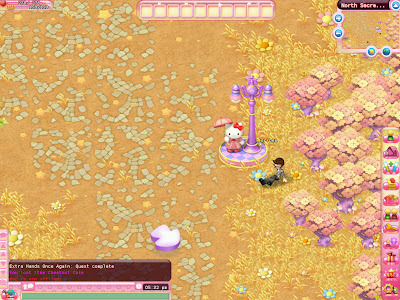 2 weeks ago I tried playing LevelUP Game's newest MMORPG Hello Kitty Online. This is another project that aims to promote casual gaming through social media interaction. Now that I reached Level 15, I still can't get enough of Hello Kitty. Normally an Online game's life span to me is just a week but it seems HKO PH is already becoming a habit to me. I enjoy the quests specially if it requires me to pound monsters but I just found out that pounding monsters doesn't give me EXP so most of the time I spend my times harvesting for minerals even without quests. Farming and Tailoring is the most difficult tasks for me since level 1. There is a quest on tailoring that requires me to forge materials 3 times. And mind you, you really need some math skills on counting materials so that you don't need to waste time travelling back and forth areas to harvest for more and go back again in the town to give the items to the quest giver. Farming could be fun but it is really very frustrating how the time format in farming is so fast. A day in farming is just a couple of minutes. And it still runs when you go out of the farm. So to prevent my farm from dying, i must visit them regularly and water them. And take note, water is very costly. So far I'm still hooked up with HKO and and I enjoy traveling and discovering new areas where I'm amazed of the creativity of Design that blends to every Sanrio character. 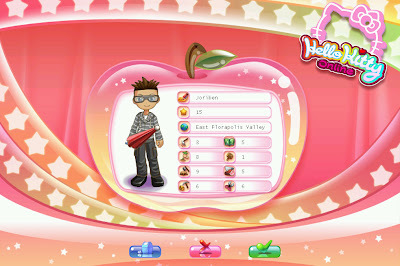 To those who wants to try the game, here are some helpful tips that will surely give you edge on the world of Hello Kitty Online. Play the flash tutorial. before you install the game on your PC, there is a flash format version of the HKO game but this game is created for basic training. 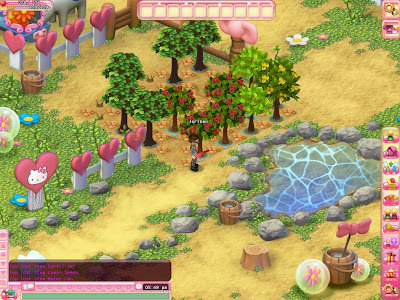 Here you will learn most of the basic aspects of the game including harvesting, mining, farming etc. Many HKO newbies skip this that is why they end up asking other users how to do this and where to get that. So play the basic training/tutorial to learn things you don't need to ask. Read Quest Instructions carefully. When you accept Quests from NPCs (Non-Playable Characters), they will give instructions to what items or tasks they need and where exactly is the area where you can find them. To review the instructions you can access the Quest Log on your sidebar panel or by pressing "Q". Save Money. Don't be a compulsive buyer. Some items are available on merchants but they do really cost a lot so to save. Don't buy because you will eventually get items and equipments through quests. Refrain from doing shortcuts. Specially on skill based quests. Some quest items are available on merchants but its better to do the quests according to the instructions because you will loose the chance to level up your skills. Don't throw loots. When you harvest or gather materials, you will eventually get some loot items that you don't need. It piles up on your limited inventory and there is a point that you really need to free spaces. Instead of throwing away loots, sell them to the merchants for some extra kitty Dollars. And lastly play Nice. Be friendly, we know that Hello Kitty's brand promotes friendship to everyone. So don't be harsh to anyone. So that's it. Here is my latest recap on my Kitty adventures in Sanrio Land. 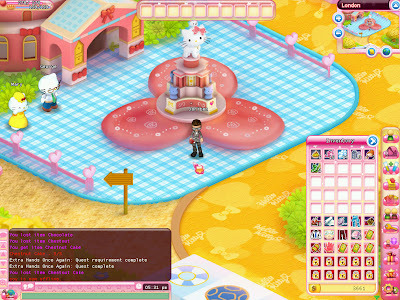 To start playing Hello Kitty Online Philippines go to this link. Hope to see you online.